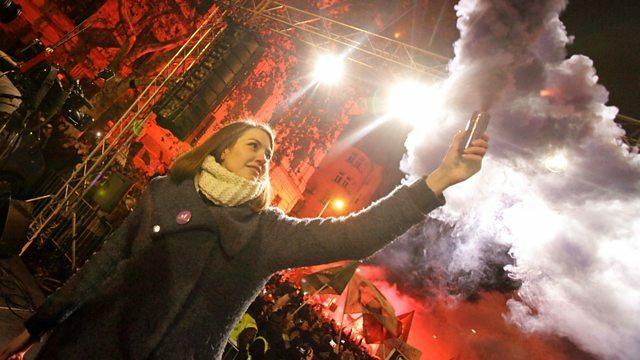 The protests against a new Hungarian law which could see employees asked to work 400 hours of overtime a year. Kate Adie introduces correspondents' stories from around the world. A controversial law in Hungary will allow employers to demand 400 hours of overtime from their workers and defer payment for three years. Nick Thorpe examines the rationale behind it, and watches as more than ten thousand people take to the streets in protest. Lorraine Mallinder shares a story of survival and escape from Cameroon’s English-speaking regions, where hundreds of thousands of people have tried to flee violence between local separatists and the military. Jonah Fisher has the tale of a Ukrainian woman who thought her son had finally been found in Afghanistan. He went missing more than 30 years ago when serving in the Soviet military there. Jeremy Bristow meets a man trying to preserve the language spoken by Jesus and his followers as he visits some of the shrinking communities of Syriac Christians who still live in Turkey. And it’s the same procedure as every year for Joanna Robertson in Germany where New Year’s Eve is celebrated with a bang.